My soft-sided full-size leather suitcase recently gave up the ghost. More accurately, it almost gave up my underwear, as a side pocket split open and threatened to spill the goods into the streets of Belgium. I could probably have the bag fixed. But it was a gift from the Doonbeg Golf Club in 2004, and I’ve done a considerable amount of traveling since. So the bag has had a pretty good run. More importantly, I’m not getting any younger, and the bag doesn’t have wheels. So, like Tiger and Stevie, it was time for a change. Providentially, I heard from the folks who represent Travelpro, long a favored brand of flight crews and frequent travelers, who were introducing a new line. I said I’d be happy to test out their T-Pro Bold 30” Drop Bottom Rolling Duffel if they cared to send one along, and they did. Unfortunately, it arrived the day after I left on a week-long trip. Then it was months before I went anywhere for long enough to justify packing anything beyond carry-on luggage. So it took awhile to test it out. When I finally did it wasn’t in my golf-writing persona, but my beer-writing guise. Meaning I wasn’t worried about packing extra golf balls. But I was facing the always-delicate task of packing a six-pack of beer and a bottle of wine to take along with me, hoping they wouldn’t break and saturate my clothes. To cut to the chase, all the bottles arrived safely–both those I took with me, and those I brought home. But all was not immediately rosy. As soon as I received it I said, “That’s one big bag,” and began to think I should have asked for T-Pro Bold 26” version. When I’m packing I’m like nature, and abhor a vacuum, usually throwing in more than I wind up needing. I knew it would be pretty easy to stuff the 30-incher until it was well over the current 50-pound limit for most flights. Second problem was that the bag is, in Travelpro’s word, “versatile,” meaning attention must be paid to how one actually packs the thing. It can be used as just one large cavity, or a zippered panel can create upper and lower compartments. The latter seems perfect for shoes and other bulky gear, so that’s what I used it for. 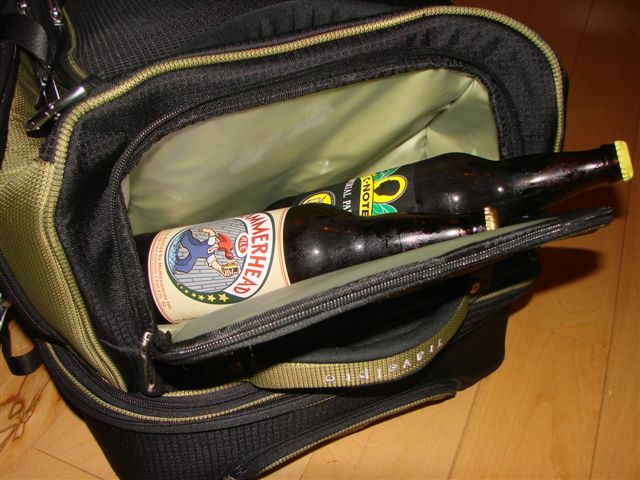 But I hadn’t quite studied the zipper system with enough rigor, so when I picked the bag up the lower compartment was partially open, threatening to spill the goods into the Seattle airport baggage area. My bad. There are a variety of compartments to use as well, one of which is a lined and cushioned pocket for food or, in my case, beer bottles. So far, so good. The company claims the bag was inspired by adventure travelers and should roll as easily over rough terrain as city streets. I certainly found it a real relief to roll rather than lug, though the numerous handles made the bag easy to lift when lifting was necessary. The company also claims the bag is as durable as they come, but time will tell there. Check back in seven years. The MSRP for the T-Pro 30” Drop Bottom Rolling Duffel is $400, but it can retail for half that.